There is an absolutely magical and rustic quality to a well-maintained old barn. The shape of it, dotting the horizon. The faded but still pretty coat of paint. The earthy smell of hay and lumber. However, some old barns aren’t magical – in fact, they’re more trouble than they’re worth. For example, some old barns require EXTREMELY expensive repairs, are difficult to use, or are even unsafe. In those cases, repairing your old barn isn’t your best bet – a total barn upgrade is. So is your old barn a treasure worth saving or is it in need of a practical upgrade? 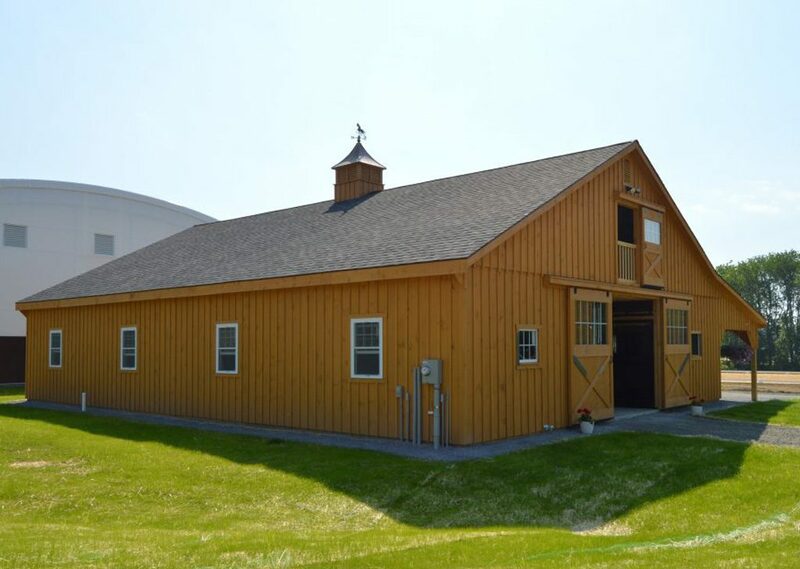 At J&N Structures, we are your barn experts, dedicated to both the country barn style and building the best modular barns for farmers, horse enthusiasts, and homeowners. 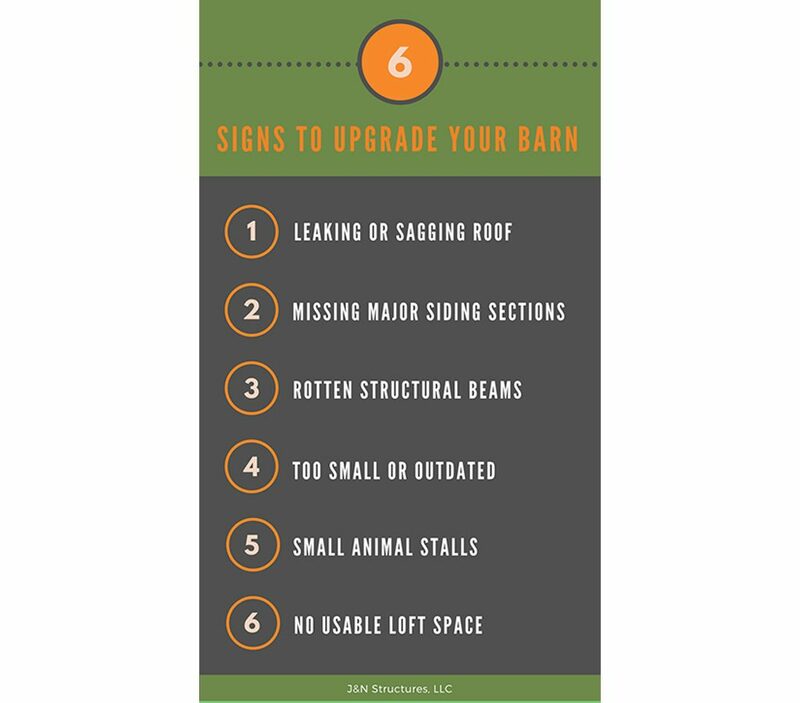 Read our blog to learn the 6 big signs your old barn needs an upgrade. Do You Need a Barn Upgrade? 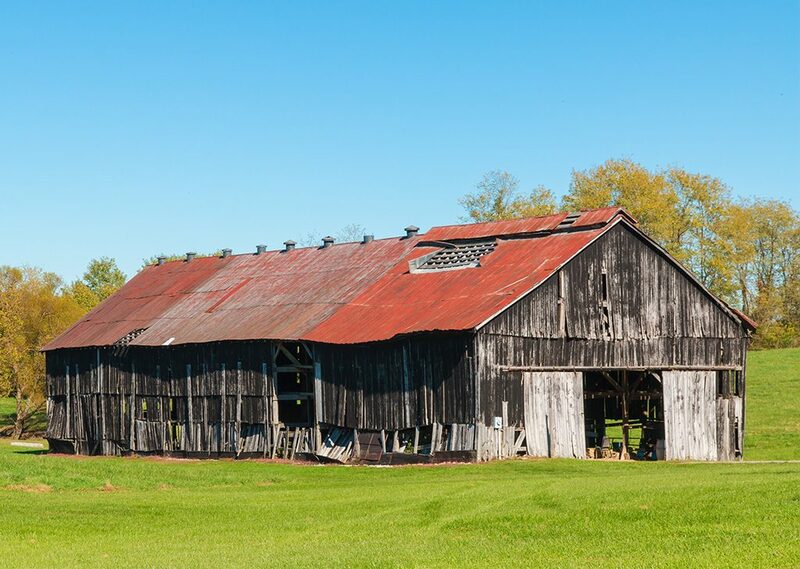 It can be hard to know whether your barn is showing the wear and tear associated with age or if it’s more of a liability than a benefit. 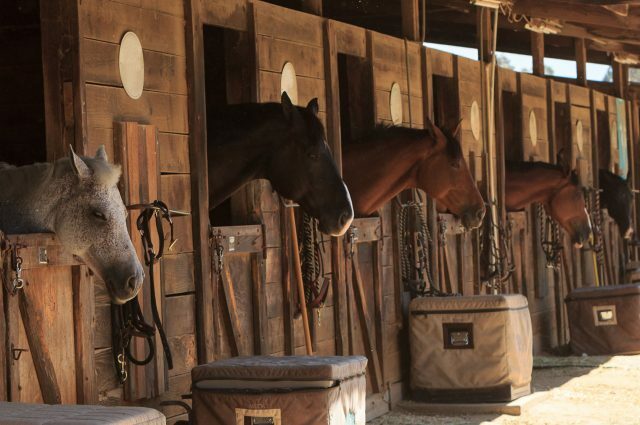 If your barn is no longer making your hard work easier and is no longer safe for you or your animals, that’s the biggest indication it’s time for a replacement. If your old barn’s roof is visibly leaking, that’s a sign that you’ll want to replace it. Repairing or outright replacing a leaky barn roof is expensive, yet ignoring it leads to greater water infiltration and damage. Rather than spending money on an expensive roof replacement, you can invest in a new modular barn. 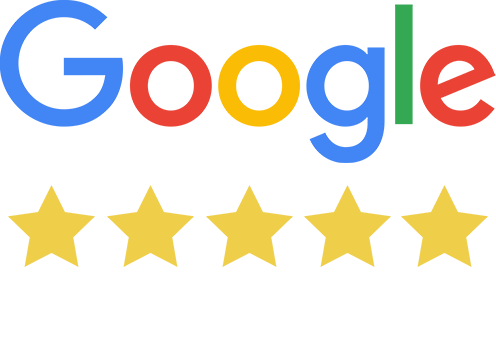 Explore our barn roofing options. Similar to a leaking roof, if your siding is no longer watertight, it will undermine the integrity of your whole structure. Beyond that, if your siding is damaged, it’ll have lost that gorgeous rustic charm you used to love. Upgrading to a new watertight modular barn will not only solve the issue of water infiltration, it’ll allow you to have a barn that looks good again. This sign is often the result of water damage infiltration that was ignored for a long period of time. 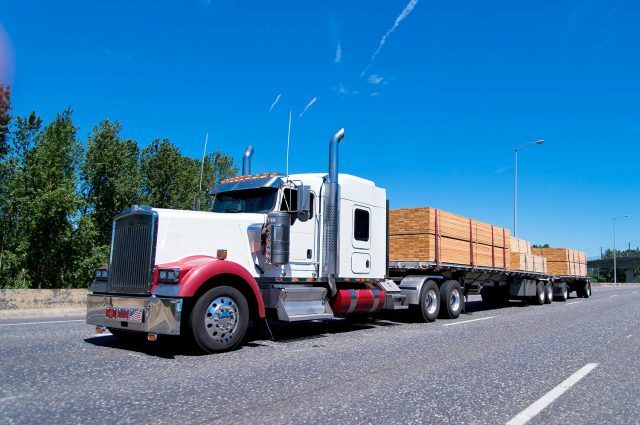 If the beams or rafters themselves are visibly rotten, you need to exercise caution. Not only could the weakened beams allow the roof to collapse, but the beams could also fall themselves. Either way, this type of issue is too serious to be ignored. This is the BIGGEST sign your old barns needs replaced ASAP. Your barn may have been big enough for your animals and your equipment a few years ago, but now it’s too small. If your farm or your operation is growing, that’s one of the signs your old barn isn’t going to cut it anymore. While being tight on space isn’t enough of a reason to condemn the barn on its own, if other repairs are needed too, this makes it all the more beneficial to upgrade to a new and bigger barn. Learn about the benefits of low profile barns. Depending on if you’re boarding a different animal or if your animals have grown significantly, you may find that they need more room. 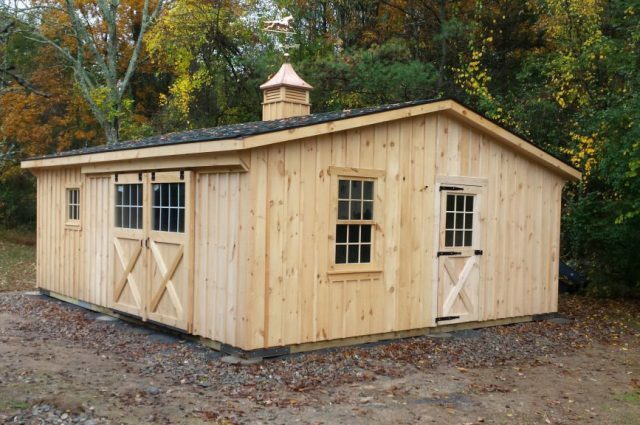 If your old barn needs other repairs as well, it can be easier to build something new with the stall sizes you want – rather than investing money to rebuild new stalls in an old, outdated barn. A loft brings more advantages than you think if you’re a farmer or you run a business out of your barn.You can use a loft for a variety of purposes such as dropping hay to your animals, storing equipment, and converting it to office space or a tack room. If your current barn isn’t equipped with a loft, but you know you’d use it, this can be the incentive for a barn upgrade. Explore the beauty and benefits of two-story barns. If you need a barn upgrade for reasons of safety, convenience, or both, consider choosing modular construction. At J&N Structures, we choose to build modular barns because of their advantages over traditional barns. Modular barns are built from higher-quality materials, can be completed much quicker, and cost far less than their traditional counterparts. See our project gallery of modular barns built across the country. At J&N Structures, we build all of our modular barns and structures in our workshop in the heart of Lancaster County, Pennsylvania. However, we sell our barns across the country through our vast dealer network. If you want to get a quote on your new barn or simply want to start the conversation, enter your zip code and find your nearest dealers.